Should I plant natives or non-natives? It’s just about the right time of year to start planning our landscape changes and additions for next year. 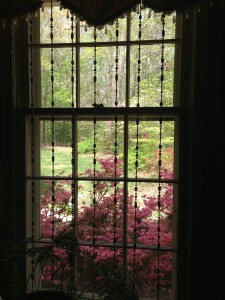 Lately, I’ve been battling a number of non-native invasive plants in my landscape. Microstegium, barberry, rosa multiflora, Asian bittersweet vine, and others. I would love to remove the majority of them from my landscape although I only have limited time during the weekends. The fact that other residents just happen to like “green” plantings doesn’t help stop the spread of the invasives in the landscape. Birds will spread the invasive plants’ berries and just make the invasion worse. Additionally, I have a few “non-native” plantings that don’t do very well in my landscape and should probably be removed. Most of us don’t want to deal with the invasive plants. 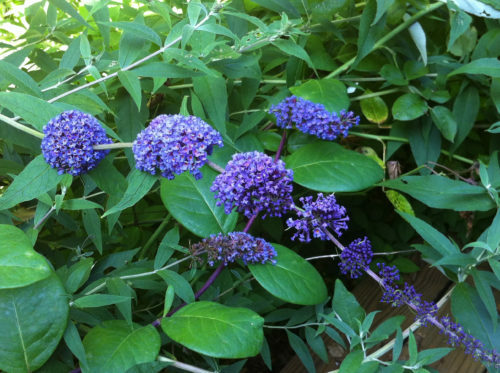 However, many more “desirable” non-native plants in my area such as Butterfly Bush (buddleia) are also fairly invasive. I love my butterfly bushes for the lively visitors that they bring. I have three basic colors: White, Lavender and Vibrant Purple. 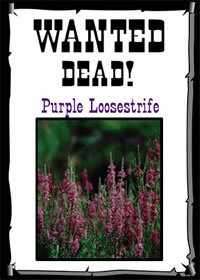 Of course, the vibrant purple one is not as prolific as the lavender which is totally invasive. I’m constantly pulling up little lavender colored butterfly bush volunteers. Interestingly, several larger lavender butterfly bushes did not make it through our winter so I had to pull out their stumps. The white hasn’t been too invasive — yet. All of them have very sweet fragrances and the butterflies LOVE them. They’re even visited by hummingbirds and hummingbird moths! However, technically, they are not native Virginia plants so I should not plant them. Sigh. Gardening is sometimes a challenge whether it’s the work or the politics. Recently, in a Facebook group page discussion, a gentleman was disagreeing with others who were discussing deer-resistant plantings. 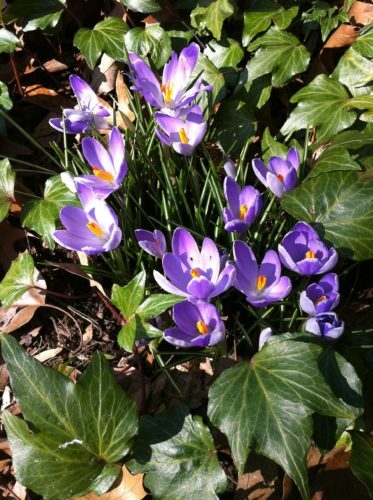 I have a number of deer-resistant plantings that are non-native and considered to be invasive. This gentleman was begging all of us to pull out the invasive plants immediately and never plant them again. That’s easy for him to say when many of us have large unfenced properties with plenty of roaming hungry deer. The perennial vinca vine, also known as “periwinkle,” has beautiful purple flowers in the Spring. It does like to creep over the brick walkway and keep me busy trimming it back about once a month. However, it has remained in my front planting bed since we moved here in the late 90s. The vinca hasn’t invaded any other area of my landscape. 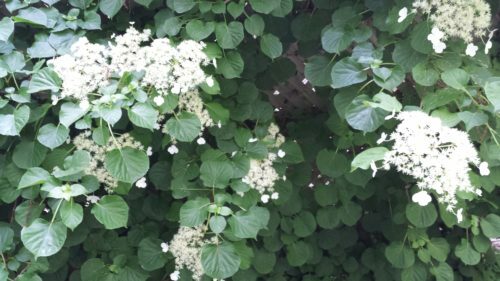 Additionally, a non-native climbing hydrangea vine attracts tons of bees to its sweet-smelling flowers. The native Virginia plants are regularly browsed by our local deer — so I’m not thrilled to have them chewing up my landscape either. The deer do love my one invasive purple loosestrife plant. This plant never even GETS a chance to become invasive as the deer will eat the flowers as soon as it blooms. I just don’t have the heart to dig it up and throw it out. 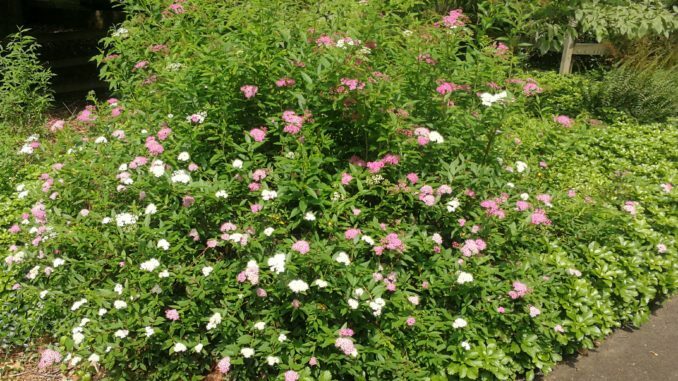 Additionally, my Japanese Spirea bushes are considered “invasive” but that really surprises me because I haven’t seen them sprouting anywhere else in my landscape other than where the 8 bushes are planted. 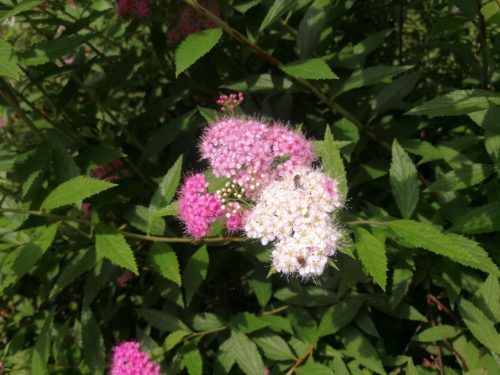 I love the Shirobana Japonica Spirea for its showy white/pink/red flowers which smell sweet and attract bees and butterflies. Now, the English ivy that I so crazily planted years ago is a constant battle. I’m getting ready to pull all of it up. 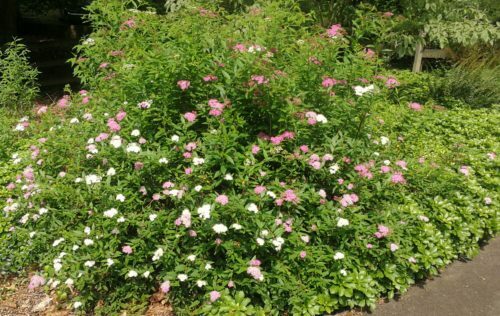 It was originally planted to cover a hydrangea-inhabited slope which was very weedy. That ivy sure choked out all the weeds and especially the dreaded microstegium! However, it’s now a burden, inching over my stone staircase daily. I have a different ivy that has a prettier jagged leaf that is far less invasive but it still gives me a run for my time. I do NOT love the microstegium. 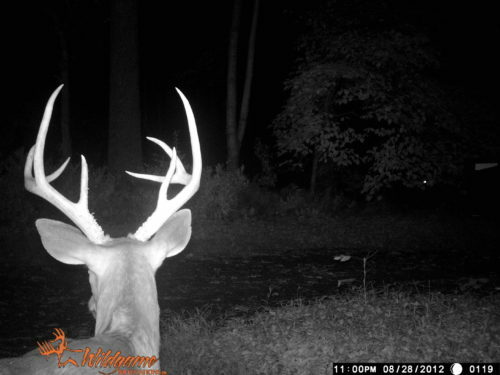 Even the deer won’t touch it. The microstegium grows everywhere that there is dry shade. At least it is easy to pull up and bag BEFORE the seed pods open. I learned the hard way that I can’t pull up weeds and throw them on the compost pile as they’ll just sprout there. Microstegium arrived in the US in the late 60s and early 70s. If you can remember back to that time, or maybe your parents remember, microstegium was used as grass-like packing material in Asia. Any cardboard or wooden boxes with china plate and teapot sets would have used the material in their packing. And of course, the packaging was thrown out along with the boxes. Microstegium is #1 on my “hit list” since 2010 as the seeds can last SEVEN YEARS in the ground without sprouting and still survive. A number of my neighbors have no idea that the “green” microstegium is just an annual weed…and are surprised when it turns brown in August. “Why did my lawn die?” Well, because that’s not lawn grass, it’s a weed, that’s why! One neighbor who has lived here for decades was telling me that years ago the local government handed out “free” invasive plants by the thousands for homeowners to plant in their landscapes. Of course, the government had no idea at the time that these non-native plants are so invasive. I am regularly pulling out Russian olive bushes (I do love the sweet smell of the flowers in Spring), barberry bushes (even if the birds do love the berries), prickly raspberry and blackberry vines (which never seem to fruit in the shade but still grow like crazy), Asian bittersweet (which has roots that reach through the Earth back to Asia, or so it seems, and can choke a tree trunk), and rosa multiflora (which never blooms but certainly seems to have all the thorns of a regular rose bush). A gardening colleague and I have watched her nearby neighbor, originally from Northern Florida, aggressively tear out expensive native deer-resistant plantings lovingly placed by previous homeowners and replace them with non-native “deer food” and invasive plantings. He also has a professional landscaping team remove his natural fallen leaves which he could have shredded into abundant natural leaf mulch, only to spread that “forever” black rubber mulch that my colleague has deemed “hideous.” Although he planted 12 various fruit trees including apple and cherry trees, the remaining several fruit trees, which would definitely do well in Florida (not Virginia), are waning after 3 years. Her neighbor has been shocked that the fancy non-native fruit trees’ trunks were damaged by deer antlers over the winter. And the tree branches’ flower buds have been browsed by the deer so no fruits have formed. Additionally, he planted all sorts of non-native varietals that prefer much warmer climates. Bottom line — Florida weather is not the same as Virginia weather. He seems to be getting terrible advice from someone who clearly has not gardened in this area. For the next few years, and if/when I move to another location, I will attempt to plant only native species of plants, bushes, and trees. Native plantings will encourage the wildlife to thrive and survive. 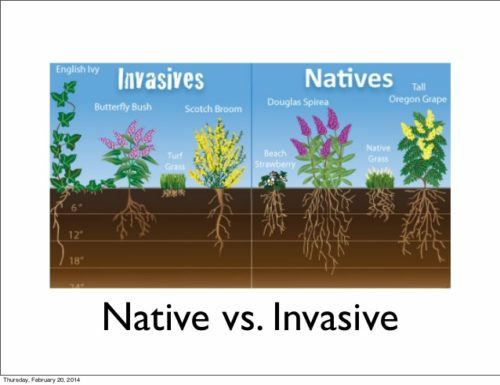 So, if you are wondering “Should I plant natives or non-natives?” and rid your property of invasive non-native plants, you can start your research. 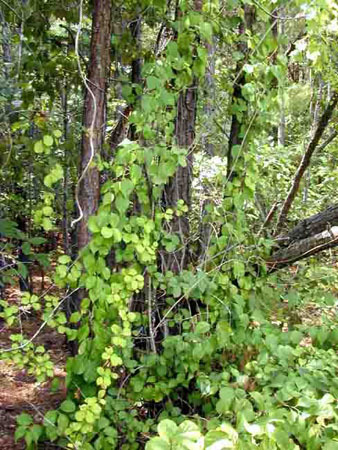 Begin by finding a list of your local invasive plants at this site. Native plants can be found in lists by state at this site. 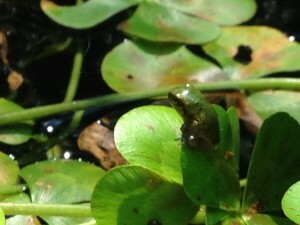 To sum up, my advice is this: Plant natives and non-natives as long as neither is invasive. 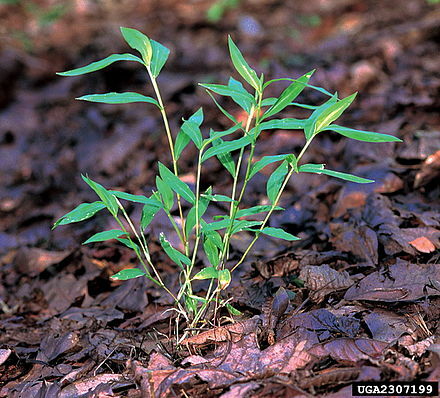 While natives are preferred, the invasives are the danger to the natural surrounding areas in your region. What are your thoughts? Please leave a message and let us know!